The Japanese yen is making gains against a handful of currencies towards the end of the trading week. Currency investors appear to be bullish on the federal government’s positive tone on the Bank of Japan (BOJ)’s success in the economy. Traders are also sifting through recent reserve data, which showed a dramatic rise from the same time a year ago. Prime Minister Shinzo Abe delivered an address to the parliament on Wednesday in which he celebrated the central bank and its governor, Haruhiko Kuroda. He explained to lawmakers that his administration accepts the reasoning behind why the BOJ has failed to reach inflation targets, noting that the national economy would have been in a worse situation if it were not for the stimulus program. The BOJ cited tumbling crude oil prices, as well as the public’s so-called deflationary mindset for low inflation levels. Despite the BOJ initiating an asset-buying program to spur growth and eliminate deflation, inflation has failed to reach the 2% target. For Abe, who has come under heavy fire for his Abenomics package since coming to power, he is pleased with Tokyo and the economy. What’s most important is what is happening to the economy as a result of the BOJ’s target, which is that more jobs were created. On the data front, capital spending is projected to expand 1.8% in the fourth quarter, rebounding from the 2.8% decline in the third quarter. Private consumption is expected to climb 0.8% in the October-to-December period – private consumption represents two-thirds of gross domestic product (GDP). The experts estimate that annualized growth will lead to a 0.4% quarter-on-quarter expansion, which is an improvement from the 0.6% slump in the previous quarter. The Ministry of Finance announced on Thursday that its foreign reserves increased to $1.28 trillion by the end of January. This is up from $2.71 trillion in December and $1.268 trillion from the same time a year ago. 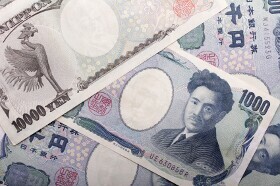 The USD/JPY currency pair slid 0.23% to 109.72, from an opening of 109.98, at 15:51 GMT on Thursday. The EUR/JPY fell 0.25% to 124.64, from an opening of 124.94.